Wolf Commercial Real Estate is a New Jersey commercial real estate firm with the expertise and contacts to help you take full advantage of the tax benefits provided by a New Jersey 1031 exchange transaction. As part of our full-service representation of New Jersey commercial real estate clients looking for the best in commercial real estate services, the team at our New Jersey commercial real estate brokerage firm can help you through your New Jersey 1031 exchange. In a New Jersey 1031 exchange transaction, the Internal Revenue Service allows you to postpone paying tax on the gain you realize from the sale of business or investment property, if you reinvest the proceeds in similar property as part of a qualifying like-kind exchange. At Wolf Commercial Real Estate, we have the knowledge to provide our current and prospective clients with detailed information about how to get the best deal possible when you are selling or leasing property as part of a New Jersey 1031 exchange. While your financial gain is deferred as part of a New Jersey 1031 exchange in a like-kind exchange, it is not tax-free. As part of your New Jersey 1031 exchange transaction, you can include like-kind property exclusively in your deal, or it can include like-kind property along with cash, liabilities and property that are not like-kind. By providing advice such as this to our clients, Wolf Commercial Real Estate helps you maximize the earning potential of your New Jersey property for sale or lease. This advice is designed to help clients achieve their real estate goals because our New Jersey commercial real estate services encompass the highest quality of service and proven expertise. As a leading New Jersey commercial real estate broker, Wolf Commercial Real Estate helps New Jersey property owners sell and/or lease their New Jersey real estate by assisting them with a New Jersey 1031 exchange. In that transaction, if you receive cash, relief from debt, or property that is not like-kind in such a deal, you may trigger some taxable gain in the year of the exchange. Working with the customer-focused experts at Wolf Commercial Real Estate, we can help you deal with those situations where there are both deferred and recognized gain in the same transaction. In these cases, the taxpayer exchanges for like-kind property of lesser value, keeping the business deal legal under federal tax codes. In addition to help with a New Jersey 1031 exchange, the proven marketing strategy we employ at Wolf Commercial Real Estate works effectively to efficiently match buyers and tenants with available New Jersey properties. The New Jersey commercial real estate professionals at our New Jersey commercial real estate brokerage firm treat your New Jersey office properties as if they were our own and work closely with you as part of our total commitment to client-targeted relationships. For companies and local individuals seeking New Jersey commercial properties or commercial properties anywhere in the country, the team at our New Jersey commercial real estate brokerage firm helps you find the office space that best meets your needs. Our New Jersey commercial real estate experts ensure the sale or lease terms are the best fit with your commercial real estate goals. At Wolf Commercial Real Estate, we help clients from the beginning of the relocation analysis process, facilitating a smooth transition into their New Jersey office properties. For more information about a New Jersey 1031 exchange or other commercial real estate transactions, please contact Jason Wolf (856-857-6301; jason.wolf@wolfcre.com), or John Mozzillo (856-857-6304; john.mozzillo@wolfcre.com), at Wolf Commercial Real Estate, a New Jersey commercial real estate broker. 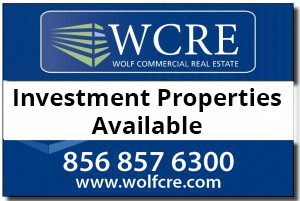 Wolf Commercial Real Estate, a full-service CORFAC International brokerage and advisory firm, is a premier New Jersey commercial real estate broker that provides a full range of New Jersey commercial real estate listings and services, property management services, and marketing commercial offices, medical properties, industrial properties, land properties, retail buildings and other New Jersey commercial properties for buyers, tenants, investors and sellers, along with helping you take advantage of New Jersey 1031 exchange transactions. Please visit our websites for a full listing of New Jersey commercial properties for lease or sale through our New Jersey commercial real estate brokerage firm. Wolf Commercial Real Estate, a premier South Jersey commercial real estate brokerage firm that specializes in South Jersey commercial real estate listings and services, now has available a New Jersey 1031 investment opportunity in Sewell NJ. This highly visible South Jersey retail space at 7 Enterprise Court Sewell NJ consists of 18,000 sf and this retail space in South Jersey at 7 Enterprise Court Sewell NJ is in a one-story building with a mezzanine area. Currently in a single-tenant configuration, this retail space in South Jersey has an expected 2017 NOI of $119,000 and this New Jersey 1031 investment opportunity is being managed by Wolf Commercial Real Estate, a South Jersey commercial real estate broker with expertise in South Jersey commercial real estate listings and services. The tenant at this retail space in South Jersey at 7 Enterprise Court Sewell NJ is High Elevations Trampoline Park and the tenant’s lease term on this South Jersey retail space has seven years remaining. 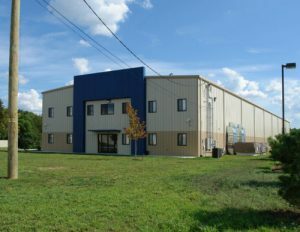 In addition, this retail space in South Jersey has a 25-foot ceiling height and tenants will find this South Jersey retail space at 7 Enterprise Court Sewell NJ is part of a clear-span industrial building. Conveniently located in the center of fast-growing Washington Township, Gloucester County, this retail space in South Jersey offers easy access to Route 55, Egg Harbor Road, Route 47, and Interstate 295. This New Jersey 1031 investment opportunity is currently available through Wolf Commercial Real Estate, a South Jersey commercial real estate brokerage firm with expertise in South Jersey commercial real estate listings and services. This retail space in South Jersey at 7 Enterprise Court Sewell NJ is zoned “CI” as a Commercial Industrial District. That means this South Jersey retail space can contain general retail merchandise stores or indoor recreational facilities. For more information about this New Jersey 1031 investment opportunity at 7 Enterprise Court Sewell NJ or about other South Jersey commercial properties for sale or lease, please contact Christopher R. Henderson (856-857-6337; chris.henderson@wolfcre.com) or Jason Wolf (856-857-6301; jason.wolf@wolfcre.com) at Wolf Commercial Real Estate, the foremost South Jersey commercial real estate broker.